The Biblia Hebraica Stuttgartensia (BHS) is the successor to the Biblia Hebraica edited by Rudolf Kittel. To this day, it is the only complete scholarly edition of the Codex Leningradensis and contains all significant text variants and proposals for correction in the critical apparatus. 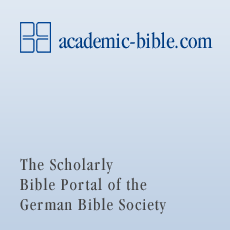 Unlike the scholarly editions of the Greek New Testament, the Biblia Hebraica Stuttgartensia does not set out to reconstruct the original text of the Hebrew Bible. This would not be possible on the basis of the manuscripts available: The oldest portions of the Old Testament date back to the time of the Kingdom of Israel (8th/9th centuries BC), from which period no manuscripts are extant today. The oldest direct textual witnesses are the manuscripts that were discovered from 1949 onwards in the Judean Desert in the caves of Qumran on the Dead Sea. Among these were the remains of some 200 transcripts of individual books of the Bible from the period between 150 BC and 70 AD. With the exception of one single transcript of the Book of Isiah retained in its entirety, the biblical texts from Qumran exclusively comprise fragments on which in most cases only a few connected words, and often no more than individual letters, can be identified. Textual witnesses in significant quantities that are important to Old Testament textual research are today only available from around the 3rd century BC: The first translation of the Hebrew Bible into Greek, the so-called Septuagint, dates back to this era. This is the oldest and most significant indirect witness of the wording of the Hebrew text as it existed at that time. Further ancient translations subsequently arose as additional indirect witnesses, in particular the Latin Vulgate, the Syrian Peshitta, and the Aramaic Targum. The oldest complete transcript of the Hebrew Bible that we know today is the Codex Leningradensis from the year 1008; almost a hundred years older, but unfortunately no longer complete, is the Aleppo Codex from 930. The Leningrad Codex and the Aleppo Codex are two prominent and exemplary instances of the so-called Masoretic Text, the version that was proclaimed definitive by Jewish scribes around 100 AD. Originally comprising only consonants, this text was provided with vowel marks as of about 700 AD. In this form, it was handed down further with meticulous care by the so-called Masoretes. The Masoretic Text does not reproduce the original biblical text in all instances. With the discovery of numerous manuscripts, above all the Qumran texts, we have at our disposal renderings of the Old Testament text that predate the Masoretic version. However, in view of the haphazard and incomplete nature of these text witnesses, complete reconstruction of a text of the Hebrew Bible is not possible. To be able to present a uniform text in a printed edition, it is thus expedient to present the Masoretic Text, with the respective extant variants in a critical apparatus – where applicable in combination with proposals for correction of the Masoretic Text. The Biblia Hebraica Stuttgartensia (BHS), which reflects the findings from more than a hundred years of Old Testament textual research, is structured according to this principle. The BHS is in worldwide use today and is esteemed among all denominations as a highly reliable edition of the Hebrew Bible. It provides the basis both for clerical training and for all reputable biblical translations. Since 2004, it has been successively replaced by the Biblia Hebraica Quinta (BHQ), which is initially being published in individual fascicles.